I finished a smaller liberated Churn Dash for my Sew Modern Bee Quilt. I pinned it over a section of the large one I did a few weeks ago so you could see the difference. Now I'm really excited to see it become a quilt! I have to finish cutting and packaging my fabrics this month to send out to my Bee partners. November is fast approaching! My design wall space changed this week. It used to be like the photo above. Now I have my large cabinet that used to be inside the closet beside my desk. It covers up a fair bit of usable design wall. Having it out of the closet has also added a lot more storage and organizing space. I also turned around the cutting table my husband made me so I could use the front drawers again!! I added this smaller design wall to the right of my cutting table. One of the 'knock off' shammies on the market. My husband bought a set of three and complained about the lint. I figured I could use one - it holds fabric great. His comment was he might need it to clean the car. I told him there was still an extra one in the cupboard! My actual design wall today has these white squares on it you probably can't see very well. They're waiting for me to iron this little pile of bright scraps to make some Variable Star blocks for Block Lotto. 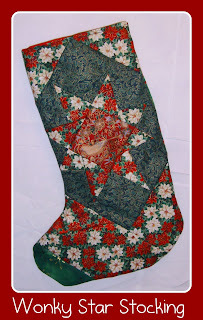 It's using the same tutorial for these stars I made for Tong's month in my Sew Modern Bee. This is what I did with my test block when I was making Tong's stars. 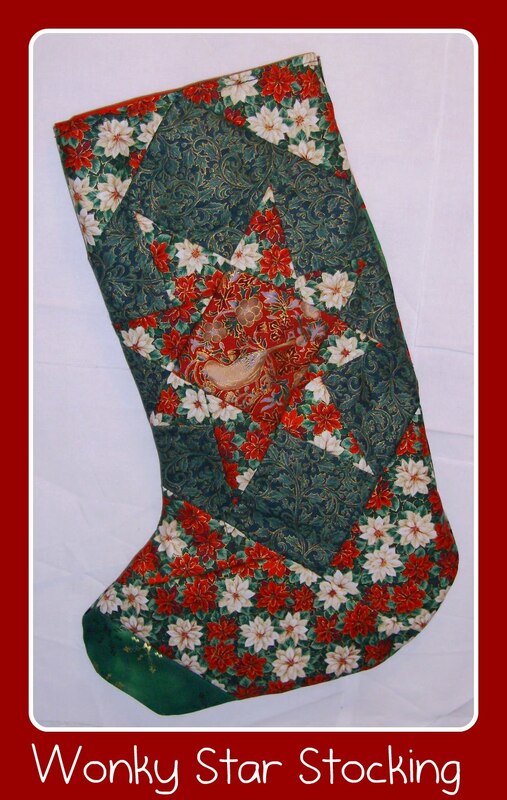 I used up Christmas scraps and turned it into a stocking. It's a fun block that uses scraps so I'm hoping to make my maximum 9 blocks this month - and maybe even win!! Check out the other design walls through Judy's links. My eyes went straight to the blue/green wonky churn dash. Love it. The wonky churn dash blocks catch the eye immediately. Sometimes to get something we have to give up something. You made a good trade -storage for design space. I still think I HAVE to make some wonky stars. Is there a tutorial online somewhere that could teach me how? Thanks for showing us your design space. I had an entire room just as I started getting into quilting then I had to move. Now I have a tiny corner in the dining room. My design "wall" is the top of my bed. I've never seen a liberated churn dash - very cool!! It would make a really neat quilt to play with scale of the block and design them together! I need to try the wonky stars they are great. Your have some great things going and all of those fab colors. Typical design wall at Sarah's...so much energy and exciting projects!